Classic Bread Stuffing made in the slow cooker is a great way to free up your oven while making Thanksgiving dinner. This slow cooker classic bread stuffing is my all time favorite Thanksgiving side dish, right in front of mashed potatoes. 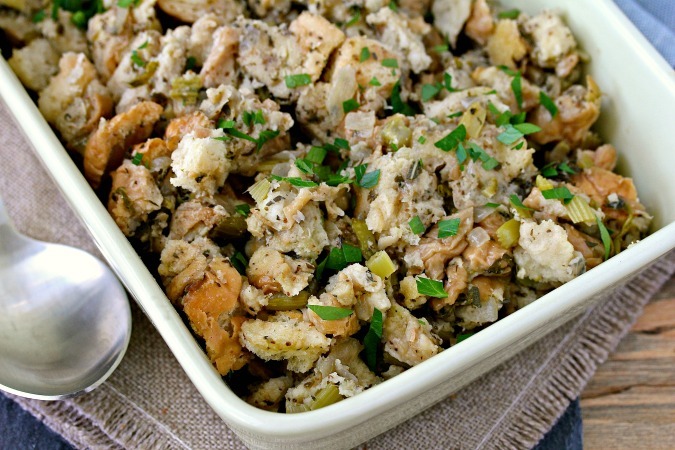 Stuffing seems perfect for the slow cooker. It was originally meant to be cooked inside the Thanksgiving bird, and the slow cooker is a great way to simulate that environment. Note: To create even more "baked in the bird" flavor, you can lay a few turkey wings on top of the stuffing while it is cooking. My favorite bread to use in this stuffing is actually not sliced bread. I always use good quality hamburger buns. It's a trick I adopted from my mom's stuffing. I love the color and flavor of the crust on every piece of bread. This recipe has a higher vegetable to to bread ratio than most. I also like to use fresh herbs, but if you prefer to use dried herbs, reduce the volume to 1/3 of the fresh. For example, if the recipe calls for a tablespoon of a fresh herb, just use one teaspoon of the dried version. 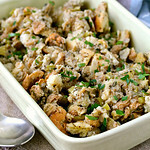 Another thing I love about this classic bread stuffing is the crispy and crusty sides that develop in the slow cooker. So good. About two days before Thanksgiving, you will find hamburger buns hanging out in the open air to dry on my kitchen counter. "Why would you dry out bread just to douse it with butter and broth later?" you ask! This step is essential for texture. Otherwise you'd just end up with soggy bread. Also, the dry bread absorbs so much more flavor from the broth, vegetables, and herbs. If you don't have time to dry the bread naturally, you can cube the buns and dry them in a 275 degree oven for about an hour. This is a simple recipe, but it will always be my favorite stuffing, or if you are from another part of the country, "dressing." I just cannot add fruit, nuts, or meat. I'm normally not a picky eater at all, but the whole gestalt of classic bread stuffing is what gets me. 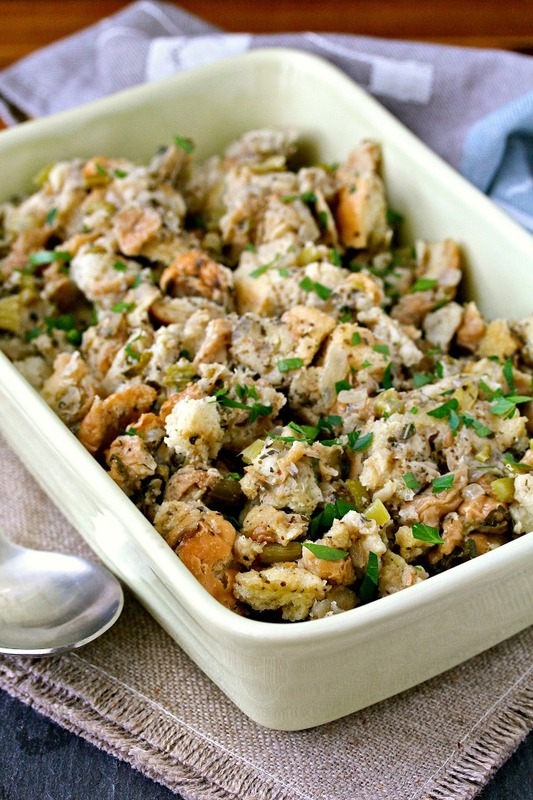 If you're a classic bread stuffing fan, I recommend trying this slow cooker version. I hope you love it as much as I do. In a 12 inch skillet, melt 2 ounces of the butter. Add the onions, celery, garlic, sage, thyme, celery seeds, nutmeg, cloves,and salt. Cover and cook for 5 to 7 minutes until the vegetables are softened. Cool to room temperature. Toss the bread cubes with the vegetable mixture in a very large bowl. Season the mixture with pepper to taste. Add the rest of the melted butter, and then add enough broth until the mixture is damp/dry. Brush the interior of a 6 to 7 quart slow cooker with melted butter and add the bread mixture. Top with the optional wings, if using. Cook on low for 3 1/2 to 4 hours. Remove the wings and garnish with the parsley. I LOVE keeping my oven open for other dishes while the stuffing cooks in the slow cooker! It's great when you have only one oven. 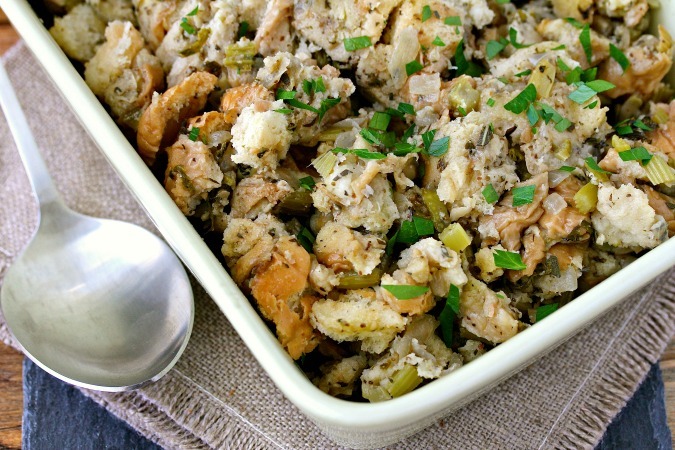 I love the idea of using a slow cooker for stuffing! Genius way to free up oven space on Thanksgiving! Thanks for linking up to the Friday Frenzy!